The front desk people are very accomodating especially Jarcell, he is such a great person. Sumptuous breakfast is available up to 10:00 AM, where else can you find a hotel like this! 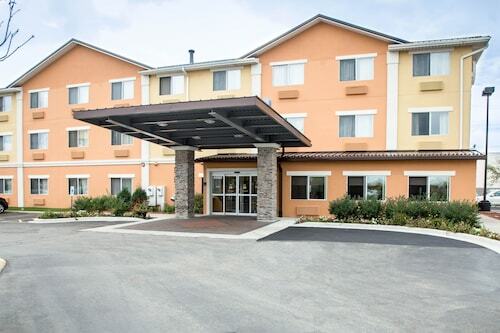 Excellent breakfast, clean rooms,helpful staff.convenient location to restaurants. Very nice friendly staff. My son graduated boot camp and the hotel put a sign on our door. Very unclean facilities. Too much noise from younger crowds that live there. Will not book again. On the other hand the Office staff is kind. So you're thinking about a vacation to Waukegan? If you want a place to call home that's located close to Waukegan attractions, use Orbitz to pick your travel dates, and then presto! Look through the list of hotels and other accommodations to find those that are located near everything you want to see and do. We make it easy to find a convenient flight into Kenosha, WI (ENW-Kenosha Regional), which is 15.3 mi (24.6 km) from the heart of the city. Find the ideal flight in nothing flat by using the filters on our site to narrow down your search. Take a dip when you stay at one of these Waukegan properties, noted for their pools. What's the Weather Like in Waukegan?